As we move to the interior of the Costa house most of my focus has shifted to the kitchen. I have to admit that it's a little strange that I am getting the opportunity to build the kitchen of my dreams in the one place that I don't really cook that much ("assemble" may be a more appropriate word). I suppose the upside of this is that I won't be tempted to go overboard with appliances and gadgets (I'll save that for the BBQ area) but it also means we will likely end up with a pretty minimal and forgettable space. 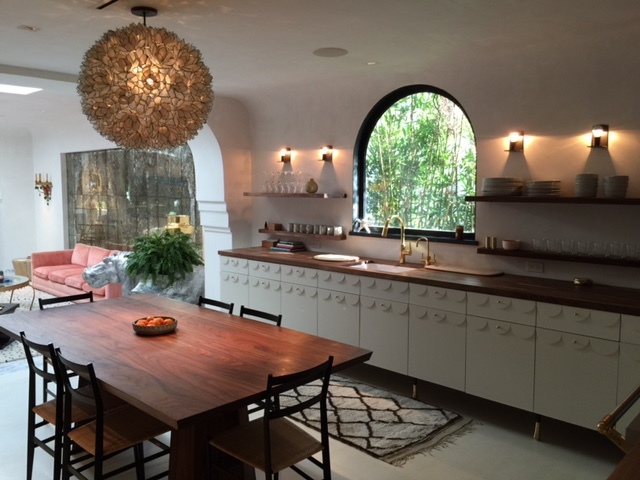 As I was scouring the internet for kitchen inspiration this weekend I stumbled upon this kitchen designed by LA based Commume for jewelry designer Irene Neuwirth and let's just say that this space is the exact opposite of forgettable. Memorable, remarkable, unique, special, enviable... these are the kind of words that describe this space and that's not even taking into consideration that Lacanche range! What I love the most about this kitchen is that it combines so many elements that are very "now," like the wood counter tops, painted floors, white cabinetry and brass accessories, but it's been pulled together in a such a way that it feels true to the design of the original home; just updated. This is so incredibly hard to accomplish and I can honestly say that even in my wildest dreams I could never pull off a design like this. I wish I can pinpoint what it is that I love the most but that would be like choosing between children, it's impossible!